There are plenty of reasons why you may need an MP3 Converter especially these days when downloading is the 'in' thing but this converter is special because it also allows you to extract music from videos. The converter supports a number of videos. It also converts music files to MP3 files. Many YouTube downloaders will only download videos that are longer than 90 minutes and not audio tracks. This means you cannot access longer music mixes on YouTube but now you can with the MP3 Converter. You simply download a long video and then extract the MP3 track from it with this converter. There are nine format options plus there are sub-groups you can pick from such as the ability to add tags or auto-name your file. The MP3 Converter allows you to get around the restrictions that online music publishers keep enforcing on the Internet. Plus the converter has a series of options and functions that allow you to customize how your music track/file outputs. You may customize your experience with the converter for greater control of the conversion process. Convert your files with this program to make them compatible with your audio-playing software. Convert more than thirty video or audio formats to mp3. Including wma, wmv, flv, mp4 and wave. Mp3 converter is an audio and video file format converter. Mp3 converter reads a media file and maps the video or audio file data into another media file container such as wave or windows media audio. Mp3 converter can convert to mp3 or from mp3 with more than 30 audio and video file formats supported. When converting to mp3, this converter works by reducing accuracy of certain parts of sound that are considered to be beyond the auditory resolution ability of most people. Mp3 converter produces good quality audio files. After the conversion process, one will not notice any changes in the quality of sound involved. The size of mp3 audio files is usually smaller than most audio and video file formats. Cool software, one of the best in its category. 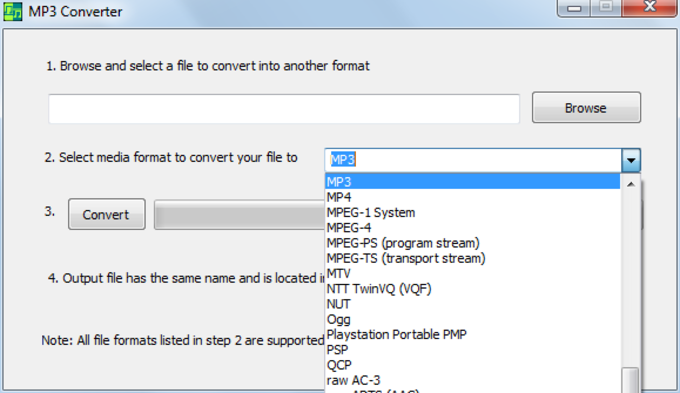 Mp3 converter will convert most video or audio types. There is along list of file types to convert to. Haven't tried all of them yet but so far so good. I like the speed at which it converts.